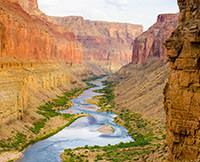 REALLY Experience the Grand Canyon! Through the years, I have had many hiking experiences in the Grand Canyon. Rim to Rim; Havasu Falls and Toroweap to name a few. These hikes had led me to believe I had really experienced the Grand Canyon. BOY! WAS I WRONG! Until you have floated through the Inner Gorge; you have not truly got a feel of the grandeur, beauty, history and excitement of the Grand Canyon! A group of six on a "guys trip", we booked a seven day Grand Canyon trip. 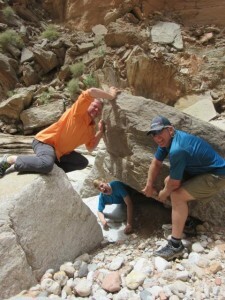 Western River Expeditions had been highly recommended to us by friends. They exceeded all our expectations. Our guides, Laramie and Lucky, had over forty years experience between the two of them. It was evident from the start that they were top professionals and serious about safety. The rapids were BIG and EXCITING! Laramie's experience was evident as we approached Crystal Rapid and Lava Falls. These rapids lived up to their reputations. The beauty of the canyon was phenomenal. This beauty was enhanced by Lucky's narratives on the history, geology and river lore of the canyon. The side canyon hikes each had it's own special features: Slot canyons, ruins, waterfalls , springs and travertine pools. Laramie and Lucky seemed to know how to time our morning departures so that we had our hikes to ourselves. After each day of viewing unbelievable landscapes, running big rapids and hiking side canyons we were treated to the best food in Arizona. As we relaxed after these dinners, Laramie and Lucky informed us of the next day's adventures. You could tell they loved their lifestyle, and their enthusiasm for the next day's excitement was contagious. As we laid in our cots under the bright moonlit sky, we realized no words or pictures could do justice to the sites we had seen or the excitement we had experienced each day. After seven days on the Colorado River in this canyon setting, I now feel like I have REALLY experienced the Grand Canyon!